Fencing Swords and rapiers for sale include a variety of functional, stage combat and display swords. These pieces feature traditional and historical designs like the famous swept hilt rapier. Buy all types of popular fencing swords and rapiers on sale now. Hutton Sabres for sale are 37 ¼ inches in all. 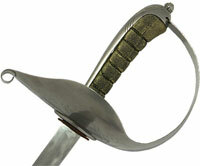 The Hutton Sabre is a battle ready stage combat sword that features a button tip for reenactment. The 31 inch blade is manufactured of high carbon flex tempered 9260 steel. They have a 6 inch handle and weigh 1 pound 6 ounces. The Hutton Sabre is designed to provide a realistic military training blade. Thus the blade, although shortened and lightened, closely resembles a real military sword. Buy the Battle Ready Hutton Fencing Swords for training and stage combat for $169.99. Leather Sword Belts with universal frog for sale is made of black leather with an attached frog and metal skull and crossbones accents. This one size fits most sword belt will hold one sword, main gauche, dagger or dirk. Buy this popular sword belt to compliment your sword set for just $39.99.